Esther is one of the Blandita dolls by Paola Reina but she's different to the other three because she is the only one with brown vinyl. Bandita translates to 'soft'. Esther is one of the Blandita dolls by Paola Reina but she's different to the other three because she is the only one with brown vinyl. Bandita translates to 'soft'. Indeed Esther is soft and cuddly in the middle with sweet realistic vinyl limbs which is perfect for a child of age 3-5 years. An added feature loved by this age group is her pleasant slight vanilla scent. Her size is 36cm and she's lightweight so easy to carry around. Her brown hair is rooted, thick and quite long. Her eyes are brown and close, another feature which children love. 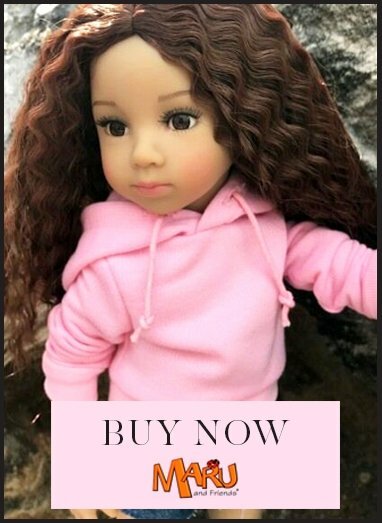 What parents love is that Paola Reina Blandita Esther is highly comparable with Ma Corolle dolls but is so much lower in price especially when you consider that she comes wearing this stylish outfit, while Ma Corolle dolls don't come with any clothes! Paola Reina was established in Spain in 1994 and has achieved worldwide success with its beautiful dolls. Paola Reina dolls are thoroughly European as not only are they made in Alicante in coastal eastern Spain, all their component parts are sourced from Europe.